A vampire with otherworldly ambitions. A vampire hunter, adrift in a sea of grief. And an oblivious girl, over whose fate they fight. Devastated by grief, Lucy fled from her supernatural birthright as a vampire hunter. Now in college, she hides her superpowers from everyone except her best friend--who's a witch. When a vampire targets an innocent high school girl, Lucy must hunt again. Can Lucy win a tug of war where the prize is a girl's life? 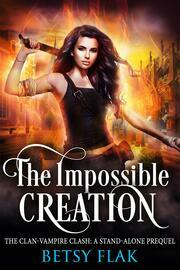 The Impossible Creation is a stand-alone prequel to the upcoming The Clan-Vampire Clash, a series of YA paranormal fantasy novels. If you like sinister villains, complicated superheroes, and supernatural suspense mixed with high school drama, you'll love The Impossible Creation. Perfect for fans of Twilight, The Mortal Instruments, and Buffy the Vampire Slayer. Find out what readers are calling "brilliant," "engrossing," and "a new take" today!